FILE - Online activist Thy Sovantha, 19, left, and a friend use their mobile phones and social media in a cafe in Phnom Penh, Dec. 11, 2014. Just 10 years ago, Cambodians relied on dingy, storefront internet cafes if they wanted to surf the web. Computers were old, power cuts were frequent and overhead fans creaked along in a futile effort to keep customers cool as they paid to send and receive emails by the minute. Local businessman Sourn Narein recalls a time not so long ago when smartphones were as peculiar as Wi-Fi-enabled laptops. One recent morning in Phnom Penh, as he sipped Italian-style coffee in a trendy air-conditioned cafe — surrounded by fellow smartphone- and tablet-wielding young professionals — he stated the obvious. Young middle-class Cambodian urbanites have access to all the latest hardware and software. They follow the news on their smartphones and research school assignments online. For some, economic growth, higher incomes and increased standards of living are only perpetuating the country’s mass embrace of digital technology, particularly in major towns and cities. The statistics are compelling. According to the Telecommunication Regulator of Cambodia, internet users grew from about 320,000 in 2010 to 6.7 million by the end of 2015, while digital marketing firm Geeks In Cambodia reports that the 15 million-strong nation now has 3.4 million individual Facebook users. Not only has the technological shift made it easier to do business, Cambodia's rapid social media growth also is driving change on the political landscape. 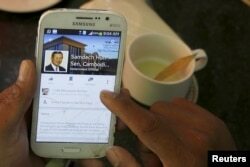 Vibrant use of social media platforms and digital devices by Cambodia’s youth is widely believed to have contributed to the extremely strong performance of the opposition Cambodia National Rescue Party in the 2013 national election, when the ruling Cambodian People’s Party lost 22 seats in the National Assembly. Even Prime Minister Hun Sen appears to have taken note. Adopting Facebook to implement principles of of e-governance, he recently told his cabinet to exploit the platform for fast, responsive, accountable service — most likely because of its popularity among politically conscious Cambodian youth. “Information and communications technology are almost completely changing the way Cambodians live and work these days,” said Khov Makara, a spokesman at the Ministry of Post and Telecommunications, who discussed a government-backed policy paper that aims to achieve greater “connectedness and readiness” by 2020. For Kheng Piseth, who monitors the tech sector for the Open Institute, a Cambodian NGO focused on developing education and access to information technology, there's no need to wait. “We should try to predict the future needs of the people and figure out what they will want to make their living conditions more convenient, before thinking of inventing something new to deal with those needs," he said. FILE - A person uses a smartphone to look at the Facebook page of Cambodia's Prime Minister Hun Sen during breakfast at a restaurant in central Phnom Penh, Cambodia, Oct. 7, 2015. At one middle school in Phnom Penh, Sreyneang On, 13, has already taken up that forward-thinking initiative. By compiling an all-female student team to develop the "ImEx" mobile application, Sreyneang created a marketplace platform designed to connect farmers with potential buyers. Coding under the alias LiGeek team, the middle schoolers aim to help farmers circumvent price-gouging middlemen by selling their produce directly to consumers. “We created this mobile app in the hope that farmers will get paid better prices for their hard work,” Sreyneang told VOA Khmer. The question may be whether the boon of Cambodia's rapidly growing sector can spread beyond the urban centers that are fostering its growth.